This extension doesn't run on Windows. of coz, still got Scribus and Gimp Separate+ (now im doing big catalogue for travel studio) but it is gonna be a little bit hard to finish everything. I can't manage this extension to work on Ubuntu 12.04 LTS with Inkscape on the Ubuntu Software Center. I have tested latest Inscape Trunk, not work either. I have contacted the author via his e-mail(jbopen@gmail.com), no respond so far. When I tried to generate CMYK PDF, error message appears in Inkscape. And generated PDF was broken. And when I tried to generate CMYK TIFF, error message appears in Inkscape. And generated TIFF was broken. convert: unable to open image `"/usr/share/color/icc/SWOP2006_Coated5v2.icc"': No such file or directory @ error/blob.c/OpenBlob/2617. convert: no decode delegate for this image format `"/usr/share/color/icc/SWOP2006_Coated5v2.icc"' @ error/constitute.c/ReadImage/544. convert: unable to open file `"/usr/share/color/icc/SWOP2006_Coated5v2.icc"': No such file or directory @ error/blob.c/FileToBlob/940. Another 2 extension, PNG CMYK and JPEG CMYK, both display similar error, none of the 4 extension work as expect. I would like to test on Linux but for some reason Google Translate cannot process the two pages listed above. Perhaps this can be made avaiable via the Launchpad PPA inkscape-trunk? This is some coincidence. I have just spent a good hour or so translating outputpro .py file into English (again) for my own benefit. I did wonder at the lack of response and put it down to this extension being 'linux only' but it does work (often slowly) and produces cmyk jpeg with embedded colour profile. Google translate works although I am still not too sure about some of literal translations. For the web page try this. A screenshot from my machine http://i.imgur.com/HFvLA.jpg The extension is a beta and I still get the odd error message but it works. a big please and is it possible to add a pdf output option. 2) I do not know what to do with export-tiff-cmyk.patch Do I need to install another extension first? 6) when I create the directory ~/.uniconvertor, I still get the errors from above. Last edited by Pander on Thu Nov 01, 2012 10:45 pm, edited 1 time in total. I installed OutputPro; it looks very promising. I have high hopes for this extension - Inkscape users really need pro pre-printing options and we're pretty close to it with this extension IMO. Looking at your issues, fair enough. I use this extension and find it useful, the author probably needs a bit of help and encouragement above anything else. My coding started at college with fortran and ended late 80's with quickbasic 4.5, lol, so I'm not much help. English - I made a translation for my own benefit, anyone wants to try it, more than welcome. It is on my rapidshare account (0.75 MB including a pdf of the portuguese - english translations I gleaned from google.) Not a 100% but usable. AFAIK from the authors webpage, this extension is only for linux. It does throw up an error message at the end but does work. It is a beta after all. Output formats, That list on the webpage looks to me like a timeline and has not progressed beyond jpeg. Certainly could do with pdf, except for tiff I never got the earlier extensions to work. DPI and print size, I think I know what you mean, but a raster image is measured in pixels so an image @ 100 ppi say 100 x 100 pix, then same image @ 300 ppi = 300 x 300 pix, which I am sure you know. You can print that image any size you want, A6 to A0 but of course the quality will be very different. Great thread, thnaks for all the information and translation. I'm working right now a lot with Inksape for printing and I thought it would be a good idea to get a little more professional by creating pdfs with CMYK. 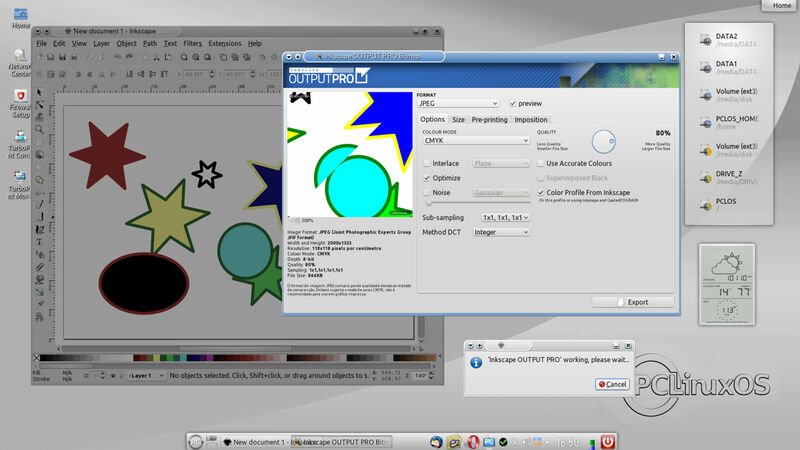 I installed Output Pro on Xubuntu 13.04 64 bit and it works. As rich allresdy mentioned, it prints out some erros, but the result seems to be fine. * Which programm for linux lets me see all the information about a picute as in rich's screenshot? * Is output Pro still under development? My protuguese is not that good, so I'm not sure what the website says. I think this tool would be great if it would offer PDF support. It is probably a linux thing...although the author could do with a bit of general encouragement. I would think that a majority of the users here are M$ or Mac based and not much interested in a purely linux extension, and/or no requirement to output CMYK images to send to a printing company. The file viewer is XnViewMP, which I like because unlike some (gwenview, shotwell) it does not try to take over the computer. It does show the file details including the icc profile name if it is embedded. Packages for all platforms http://newsgroup.xnview.com/viewforum.php?f=60 look at the top of the page in announcements. Advice I got along the way, "If you want to end up with CMYK start with CMYK". In this respect linux has a great application in Krita, It does convert from RGB to CMYK as well, so import your Inkscape png, supposed to export to PDF, sadly my PCLOS package crashes at this point. still worth a try. Any progress on getting CMYK export support for Inkscape. According to http://libregraphicsworld.org/blog/entr ... evelopment I am willing do donate/support the developer that makes this work. To communicate directly with developers, you should join the developer mailing list. https://inkscape.org/en/community/mailing-lists/ They will not see your message here, unfortunately. 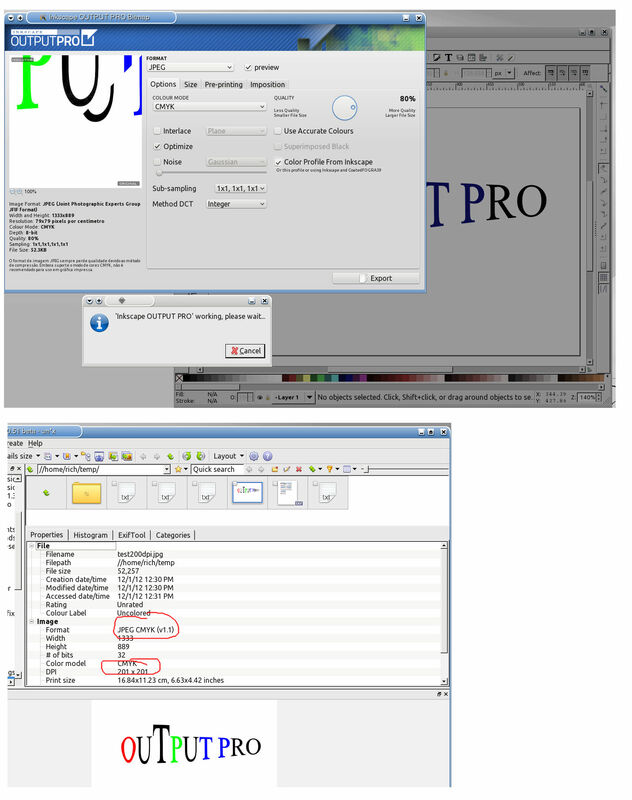 just a thought, to make the object id (label) more user friendly, "device pdf2cmyk". The thought is to "remind" the user this is a pdf based operation.